The roosting flocks of black-tailed godwits and avocets are in their allotted places within the shallow mere as they were a few days ago. Then, they roosted quietly after gathering on the flood tide. Today, they are wing stretching, washing, preening, flying and flapping vigorously just over the water to dry their feathers; their twitchy movements unsettle; their babble waxes in subdued crescendos then wanes to a quiet chatter; they are readying to fly to the freshly exposed estuary flats and there to feed. The golden plover flock is notable for being silent and steadfastly motionless. 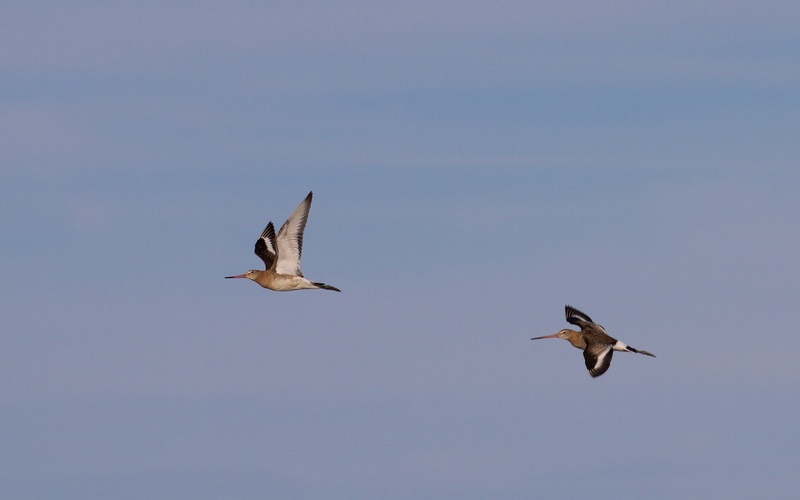 A small flock of black-tailed godwits leaving the high tide roost in the shallow mere within Oare Marshes, flying seaward to feed along the edge of the water. The pattern of the tides govern the activity of millions of waterbirds wintering on the ice-free coasts across the northern hemisphere. 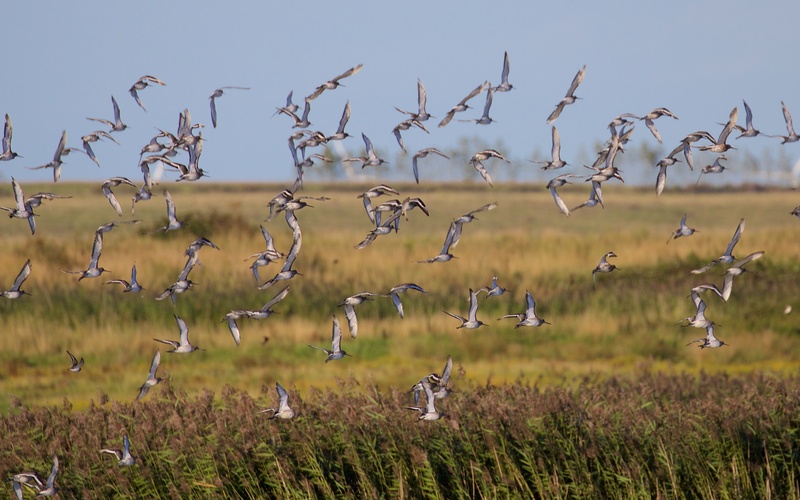 Estuarine nature reserves such as Oare Marshes are found all around the UK and provide undisturbed places on the foreshore for congregations of roosting birds; they are especially important refuges during spring tides when smaller neap tide roosting places are flooded. High water on a ‘big spring’ tide at a principal high tide roost of wintering waterbirds within an estuary is a breathtaking spectacle; a massed gathering of the clans. 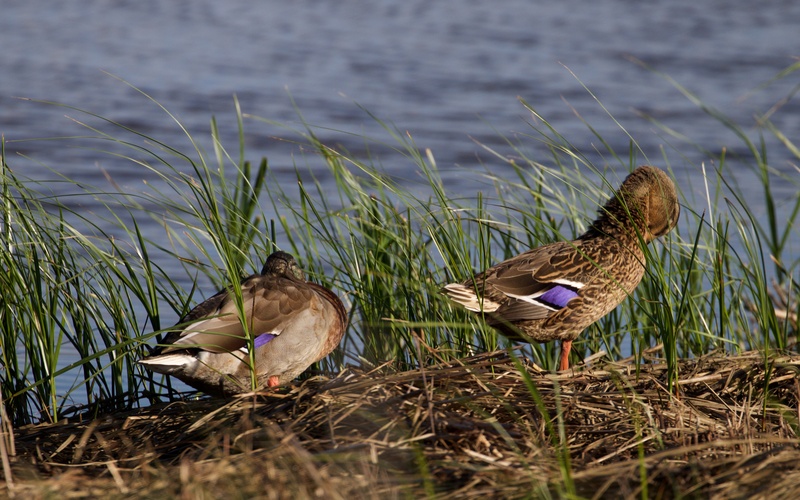 There were small flocks of mallard, readily identified by their white bordered, black-edged, brilliant blue speculum; some flying out to the estuary and others just having a good preen. We walk the sea wall and the yellow wagtails, whinchats and wheatears have all departed leaving the familiar singing robin and a few swallows. 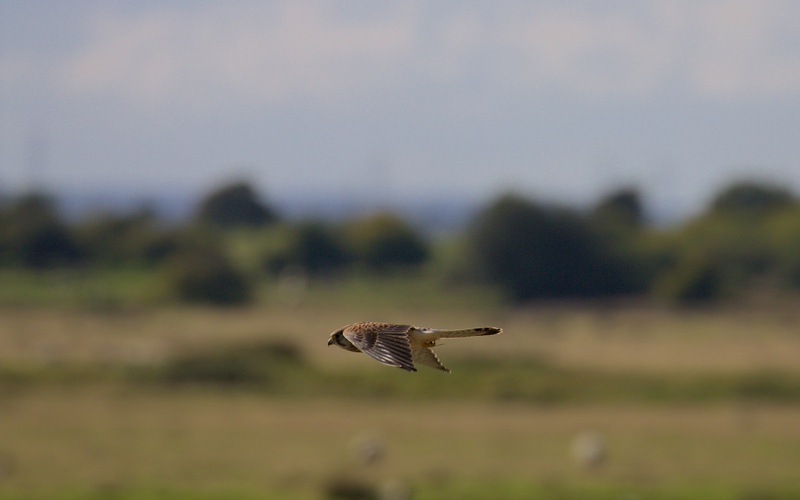 Kestrels work the neatly cut grass along the wide and gentle slopes of the landward side of the sea wall, perhaps for grasshoppers. Autumn seems a time when kestrels are most obvious perhaps because both adults and young are abroad and a harsh winter has not yet torn into their numbers. Hunting kestrel along the sea wall. 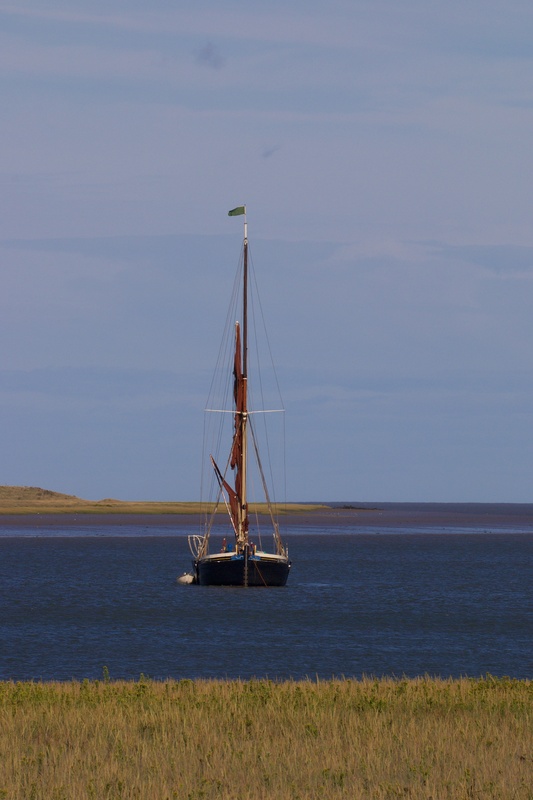 The old Thames sailing barge at anchor on the Swale. The vegetation in the foreground is a monoculture of Spartina anglica, an abundant saltmarsh grass species with an interesting evolutionary history, that could easily be mistaken for field of rice. The Spartina anglica story provides an illustration of the rapid speed of a new (or introduced alien) species’ population increase and the associated and similarly rapid decline of any outcompeted species. To précis the account by the Field Studies Council and others: Spartina anglica is a recent cross of Spartina maritima and Spartina alterniflora, the former a native species here in Britain and the latter introduced to Southampton Water (presumably by a ship) from North America in the 19th Century. The original cross was infertile producing Spartina X townsendii but, through the process of polyploidy, where chromosome numbers are doubled or tripled by a mutational accident during meiosis, the resulting species became fertile and spread rapidly. It was given the comforting English name of S. anglica. S.anglica, possessing what is known as hybrid vigour, quickly ousted its parent S. maritima and also colonised much bare mud in estuaries around Britain, as well as across La Manche in Northern France. The Dutch and many other nations quickly recognised its value and planted it to assist land reclamation. In North America, where most Spartina species occur, there have been a number of human-caused introductions resulting in numerous cases of hybridisation and subsequent takeovers by the more vigorous hybrids. Polyploidy or genetic duplication has been found to be a principal cause of speciation in the majority of plants and in many animals. Most species of Spartina and many other grass species are polyploids. Since the 1930s, biologists (and avant-garde gardeners) have learned to induce polyploid hybrids, especially in crop species such as wheat and rice, by using colchicine. No one has ever raised concerns about this human-induced genetic modification, even though the Spartina anglica example demonstrated the potentially significant impacts to ecosystems. There is much more about polyploidy in plant and animal speciation in this review in Nature; it is interesting to note that good old Spartina anglica is quoted in the concluding paragraphs as a classic example of the evolutionary advantages of the process. Our unprepossessing saltmarshes are extraordinary genetic laboratories.